Texas school children learn to summarize the Texas Revolution with three major events: the Battle of Gonzales, the Battle of the Alamo, and the Battle of San Jacinto. Although this approach presents an easy story to remember with a clear beginning, middle, and ending to the conflict, it does little to promote real understanding of the conflict. This is especially true for the Alamo, which has traditionally been portrayed as an old abandoned mission in the middle of nowhere. If it were such a worthless place, why did President Antonio López de Santa Anna feel the need to capture it? Moreover, why did the Texans feel compelled to defend it even to the point of death? The truth is that many teachers and even some historians have failed to understand the importance of the town of San Antonio de Béxar in Texas history. The Spanish recognized the geographical significance of the headwaters of the San Antonio River, which is why they established five missions, a presidio, and a town nearby. The main attraction was not just access to water, though. The region represented a convergence of vegetation, wildlife, and people. As such, Béxar became the focal point of human activity. For the Spanish, it formed the center of government, defense, and trade. In addition, it became a necessary stop for travelers journeying back and forth between the Rio Grande Valley and the Texas-Louisiana border. Although a few small communities existed along the Sabine River, Béxar represented the heart of Spanish Texas. After Mexico’s independence in 1821, the town represented the heart of Mexican Texas. Revolts like the Texas Revolution follow a simple, logical progression. To be taken seriously, rebels must capture important places both for the resources they offer as well as the symbolic value that winning such prizes represent. After their victory at Gonzales on October 2, 1835, the colonists quickly moved to capture Presidio La Bahía (Goliad) early on the morning of October 9. A few days later, on October 12, a volunteer force designated the Federal Army of Texas — assembled at Gonzales and led by Stephen F. Austin — headed to Béxar to capture it. 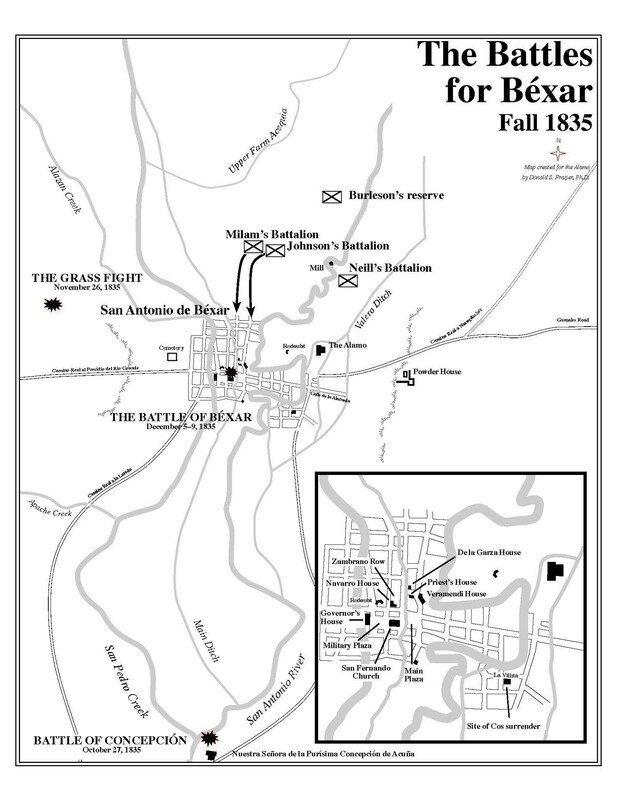 Not only was the town a commercial center, political seat, and important crossroads, Béxar held the largest concentration of troops loyal to Santa Anna and his Centralist administration in Texas. Capturing Béxar was not only strategic must for the rebels, defeating General Martín Perfecto de Cos would earn the rebels’ credibility in the eyes of the outside world. After a siege that lasted longer than a month that culminated in five days of street fighting, Cos surrendered Béxar on December 9. A few days later he and his troops marched off to the Rio Grande where they reunited with other Mexican forces. Former Mission San Antonio de Valero had served as quarters for Spanish and Mexican soldiers for almost thirty years prior to the outbreak of the Texas Revolution. Béxar’s role as a garrison town was one factor that drew Cos there. Upon the approach of the Austin’s Federal Army of Texas, Cos began fortifying the town, throwing up barricades across streets leading to the main plaza in front of San Fernando Church. Across the river at the Alamo, Cos’ engineers constructed artillery platforms at various points and built an earthwork to protect the compound’s main gate. They even placed at least one cannon on a platform at the east end of the church. The compound served as a cuartel or barracks for some of Cos’ units defending the town. The Alamo was included in Cos’ surrender of the town and its public property, which allowed the rebels to occupy the fortified compound as their barracks. Returning to the logical progression of revolutions, governments have an obligation to retake important locations captured by rebels. One reason is that rebels must be punished for their disloyalty. Another reason is that the government must show that it will not let the rebels’ gains stand. Having lost both Goliad and Béxar, the Mexican Army made plans to recapture these two important places. General José Urrea led one column to Goliad while Santa Anna personally led another to Béxar. This strategy initially proved very effective in returning control of Texas to the Mexican government. 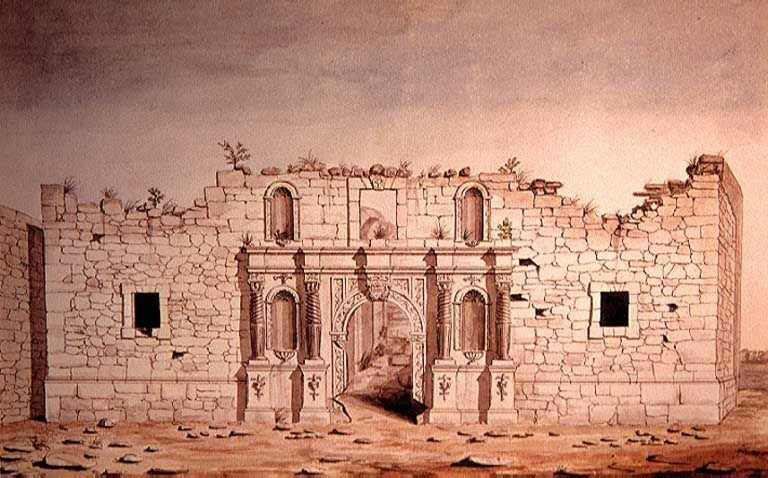 As mentioned earlier, the traditional assumption is that the Alamo, located on the outskirts of Béxar, was a worthless mission the in the middle of nowhere and therefore it was pointless and even foolish for the Texans to try to defend it. Although Sam Houston believed the town should be abandoned, other influential Texans disagreed. On January 17, 1836, Houston had written Governor Henry Smith that he had “ordered the fortifications in the town of Bexar to be demolished, and if you should think well of it [italics added for emphasis], I will remove all the cannon and other munitions of war to Gonzales and Copano, blow up the Alamo, and abandon the place, . . .” Houston’s argued that it would be “impossible to keep up the Station with volunteers” against the Mexican Army when it returned. He also contended that a site behind the frontier and closer to the line of supply would be better for gathering and training recruits. Ten days later, William B. Travis, who had been sent to Béxar by the governor after receiving Bowie’s letter, reinforced the importance of holding the town, telling Smith, “This being the Frontier Post nearest the Rio Grande, will be the first to be attacked — We are illy prepared for their reception, as we have no more than 150 men here and they in a very discouraged state — Yet we are determined to sustain it as long as there is a man left; because we consider death preferable to disgrace, which would be the result of giving up a Post which has been so dearly won, and thus opening the door for the invaders to enter the sacred Territory of the colonies.” Travis wrote Smith again the next day, February 13, to reiterate the need to defend Béxar, saying “it is more important to occupy this Post than I imagined when I last saw you — It is the key to Texas from the Interior without a footing here the enemy can do nothing against the colonies now that our coast is guarded by armed vessels.” Even Santa Anna realized the importance of the town, writing after the revolution that “Béxar was held by the enemy and it was necessary to open the door to our future operations by taking it.” The statements of Bowie, Travis, and Santa Anna refute the notion of Béxar, and by extension the Alamo, as being a place of no value. While the 1835 Battle of Béxar receded from historical memory, the 1836 Battle of the Alamo took center stage in the Texas Revolution. Governor Smith, James C. Neill, James Bowie, William B. Travis, and others never believed that the small force at the Alamo could hold back the Mexican Army. The Alamo’s defense ultimately relied on Texans returning to Béxar to confront any new threat. Travis’ famous letter of February 24, 1836, addressed to “The People of Texas and All Americans In The World,” announced the need for Texans to return to Béxar. This gives meaning to his words, “I call on you in the name of Liberty, of patriotism, & every thing dear to the American character, to come to our aid, with all dispatch.” His call set events in motion, but time and distance were not on his side. Thirty-two residents of Gonzales, who lived only 75 miles away, arrived. Additional volunteers who had come from settlements further to the east were still gathering at Gonzales a week later, yet unaware that the Alamo had fallen. Houston found nearly 350 volunteers waiting there when he rode into town on March 11, 1836, fresh from the convention on Washington on the Brazos River, where the new government had reconfirmed his command of the army. Shortly afterwards news of the Alamo’s fate reached Gonzales, sending both Houston’s newly acquired army and panicked civilians streaming eastward. The Alamo now took on a new symbolic meaning. The loss of Béxar and its garrison electrified the Texans. Spoiling for a fight, they finally had their chance for revenge on April 21, 1836, on the bank of San Jacinto River. Officers reminded their men why they were fighting. They did not need to be told, though. They knew the outcome would be “Victory or Death.” Furthermore, they had known many of the men slain at Béxar either personally or by reputation. It is likely that the cry “Remember the Alamo!” came naturally to them. “Remember the Alamo?” How could they forget the loss of such an important place and the death of relatives, friends, and companions in arms who gave their lives to defend it? John H. Jenkins, ed. “Sam Houston to Governor Henry Smith, Head Quarters, Goliad, January 17, 1836,” Papers of The Texas Revolution (10 vols. ; Austin: Presidial Press, 1973), 4:46. Jenkins, ed., “James Bowie to Governor Henry Smith, Bejar, February 2, 1836,” PTR, 4:46. Jenkins, ed., “William B. Travis to Governor Henry Smith, Bejar, February 12, 1836,” PTR, 4:317. Jenkins, ed., “William B. Travis to Governor Henry Smith, Bejar, February 12, 1836,” PTR, 4:328. Carlos Casteñeda, ed. and trans. The Mexican Side of the Texas Revolution  By the Chief Mexican Participants. (Washington, D.C.: Documentary Publications, 1971), 12–13. Jenkins, ed., “William B. Travis to the Public, Bexar, February 24, 1836,” PTR, 4:423. Other shouts at San Jacinto also included “Remember Goliad”; “Remember Tampico”, and even “Remember Wash Cottle,” an individual Alamo defender. American have often turn tragic losses into battle cries. Noted examples include: “Remember Paoli” (American Revolution); “Remember the Waxhaws” (American Revolution); “Remember the Raison” (War of 1812); “Remember the Maine” (Spanish American War); “Remember Pearl Harbor” (WWII); “Remember 911” (War on Terror).